The Nanomaterial changes its strength by electric signals. (PhysOrg.com) -- A world premiere: a material which changes its strength, virtually at the touch of a button. This transformation can be achieved in a matter of seconds through changes in the electron structure of a material; thus hard and brittle matter, for example, can become soft and malleable. What makes this development revolutionary, is that the transformation can be controlled by electric signals. This world-first has its origins in Hamburg. Jörg Weißmüller, a materials scientist at both the Technical University of Hamburg and the Helmholtz Center Geesthacht, has carried out research on this groundbreaking development, working in cooperation with colleagues from the Institute for Metal Research in Shenyang, China. The 51-year-old researcher from the Saarland referred to his fundamental research, which opens the door to a multitude of diverse applications, as a breakthrough in the material sciences. The new metallic high-performance material is described by Prof. Dr. Jörg Weißmüller and the Chinese research scientist Hai-Jun Jin in the latest issue of the renowned scientific journal Science. Their research findings could, for example, make future intelligent materials with the ability of self healing, smoothing out flaws autonomously. The firmness of a boiled egg can be adjusted at will through the cooking time. Some decisions are, however, irrevocable  a hard-boiled egg can never be reconverted into a soft-boiled one. There would be less annoyance at the breakfast table if we could simply switch back and forth between the different degrees of firmness of the egg. Similar issues arise in the making of structural materials such as metals and alloys. The materials properties are set once and for all during production. This forces engineers to make compromises in the selection of the mechanical properties of a material. Greater strength is inevitably accompanied by increased brittleness and a reduction of the damage tolerance. In order to produce this innovative material, material scientists employ a comparatively simple process: corrosion. 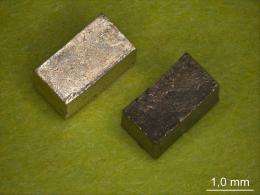 The metals, typically precious metals such as gold or platinum, are placed in an acidic solution. As a consequence of the onset of the corrosion process, minute ducts and holes are formed in the metal. The emerging nanostructured material is pervaded by a network of pore channels. 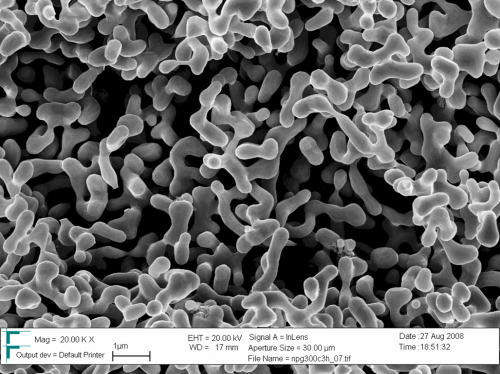 The nanomaterial under the scanning electron microscope. The pores are impregnated with a conductive liquid, for example a simple saline solution or a diluted acid, and a true hybrid material of metal and liquid is thus created. It is the unusual marriage, as Weißmüller calls this union of metal and water which, when triggered by an electric signal, enables the properties of the material to change at the touch of a button. As ions are dissolved in the liquid, the surfaces of the metal can be electrically charged. In other words, the mechanical properties of the metallic partner are changed by the application of an electric potential in the liquid partner. The effect can be traced back to a strengthening or weakening of the atomic bonding in the surface of the metal when extra electrons are added to or withdrawn from the surface atoms. The strength of the material can be as much as doubled when required. Alternatively, the material can be switched to a state which is weaker, but more damage tolerant, energy-absorbing and malleable. Specific applications are still a matter for the future. However, researchers are already thinking ahead. In principle, the material can create electric signals spontaneously and selectively, so as to strengthen the matter in regions of local stress concentration. Damage, for instance in the form of cracks, could thereby be prevented or even healed. This has brought scientists a great step closer to their objective of intelligent high performance materials. The selection of a structural material requires a compromise between strength and ductility. The material properties will then be set by the choice of alloy composition and microstructure during synthesis and processing, although the requirements may change during service life. Materials design strategies that allow for a recoverable tuning of the mechanical properties would thus be desirable, either in response to external control signals or in the form of a spontaneous adaptation, for instance in self-healing. We have designed a material that has a hybrid nanostructure consisting of a strong metal backbone that is interpenetrated by an electrolyte as the second component. By polarizing the internal interface via an applied electric potential, we accomplish fast and repeatable tuning of yield strength, flow stress, and ductility. The concept allows the user to select, for instance, a soft and ductile state for processing and a high-strength state for service as a structural material. This material breakthrough is wonderful and I see many many potential applications from this!